I’m about to start my first tour as an assistant guide, and I get to start in my favorite city: Paris. Since 2000, I’ve managed to come back to this city at least once a year, and I can’t ever seem to get enough. It never gets old, and I always learn something new with each visit. Paris, and, in a broader sense, travel itself are two of my greatest loves. In my youth, I had wonderful yet limited experiences with travel. My family mostly did camping trips, road trips to San Francisco or Vegas, one cross-country road trip, and one month-long trip to the Philippines. While I appreciated and still fondly and vividly remember many moments of those family trips, I certainly had no comprehension of what traveling really was. I was just having fun with my parents. Later, as a college student working two jobs, I never did a study abroad program. I had no time, no money, and no sense of what an opportunity it could be for me. It wasn’t until my second year of teaching that I traveled to Europe for the first time. My friend and colleague Becky Wentland (to whom I am eternally grateful) invited me to be a chaperone on a student trip to Paris, Madrid and Barcelona. To this day, I remember the series of moments when I fell in love with travel and with Paris. When our tour director Brian picked us up from the airport, I already had a perma-smile on my face because I was just so happy to be in Europe. Everything was immediately fascinating: the signs in French, the cool escalator, the customs agents’ uniforms. After having dropped off our luggage at our hotel, we headed straight away on the metro Line 1, direction La Défense. Our destination: Charles de Gaulle Étoile. Now those of you who are already familiar with Paris know quite well what we were about to see. Leaving the belly of the metro, we ascended the escalator, our eyes adjusting to the June sunlight that penetrated the metro exit. As the escalator leveled off, I saw her towering in front of me. Elegant, majestic, proud, colossal, and perfect, Napoleon commissioned this in 1806 to honor those who fought and died for France in the French Revolution and Napoleonic Wars. This monument to fête his troops (if not himself) and their numerous victories wasn’t completed until 1836 under the reign of King Louis-Philippe, and it has since been the site of countless celebrations and also painful memories: the return of Napoleon’s ashes to France, a victory parade after WWI, Hitler and his troops marching underneath the arch as they came to occupy France, the victory parade after Liberation, Bastille Day parades, demonstrations and protests, and countless laps by cyclists on the Tour de France. As soon as my mind registered what I was seeing with my own two eyes, I actually put my hand to my chest and I gasped. I couldn’t believe I was finally here in Europe. In France. In PARIS!!! 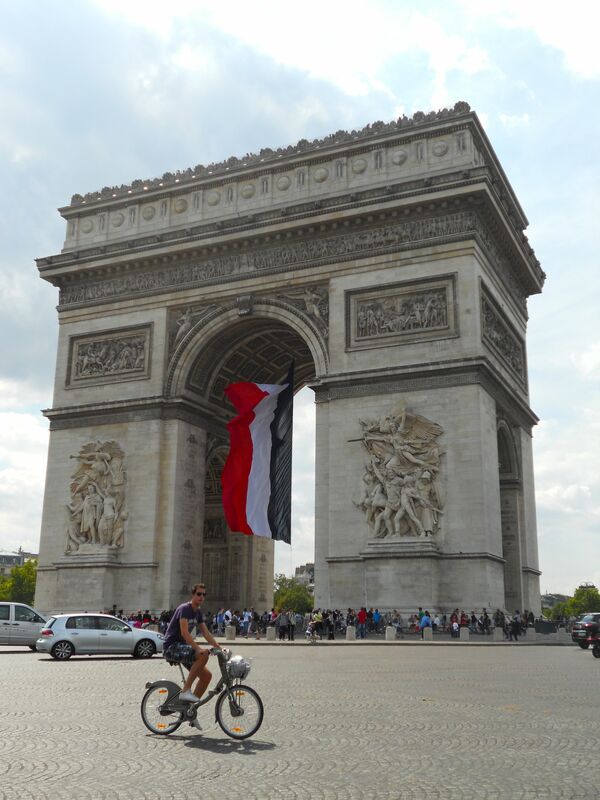 On that day, I celebrated my own travel triumph under the Arc de Triomphe. In the brief five days that we were in Paris, I had dozens of breath-taking, tear-running, and silent awe moments. At Notre Dame, I could visualize the innumerable workers who worked since 1160 to build this cathedral, I imagined the devotion it took to persevere for 200 yeas in continuing the construction, and I felt the strength of my own faith as I entered this holy space with the centuries-long procession of visitors and worshippers. Out of faith, out of love, and out of gratitude, I wept. Paris worked her charms on me at every turn. While it may have been love at first sight, it wasn’t just the obligatory sites that drew me in. It was the daily life experiences that enchanted me the most. Having a café on a terrace and watching the world go by, fumbling with my then-green metro tickets as I tried to get through the turnstile, buying in-season cherries from the fruit vendor at the open-air market, watching the lights of the city twinkle on one by one from the steps of Sacré-Cœur, and trying to decipher overheard whispers with the little French that I knew at the time. Paris can be both simple and complex, depending on your point of view. To me, Paris is equally genteel and daring. She is evocative and forthright. She seduces yet is still traditional and demure. She can whisper her secrets and boast her talents all in the same moment. She offers you her best and asks only that you respect her for what she is. If you accept her on her terms, you’ll know why you can so easily fall in love with her. And that’s just what I did. For a decade thereafter, I was fortunate to bring students to Europe on my own tours every summer. The itinerary was different every year: Paris/Madrid/Barcelona, The Grand Tour of France, France/Italy/Spain, Italy/France, England/France/Germany/ Austria, and others. But you’ll notice that France – and Paris in particular – always makes it into the itinerary. There’s something about Paris that always brings me back. As much as in my own hometown, it’s honestly where my soul feels most at home. Two important things I learned about travel since that first trip to Paris – 1) I want to discover and learn more about even more places and 2) there is nothing like seeing those places through the eyes of your students. When history, literature, language, art, politics, and all the things that they’ve studied in a classroom finally come to life before their very eyes, it is a precious and magical moment. Places I have visited on numerous occasions are still new to me when I remember to see it through the eyes of my students, to see it like it was my first time. Sharing that experience and learning what piques their interest bolsters my appreciation for that place and for the idea of travel itself. So now I find myself in a position where, after thirteen years of teaching and two years Leave of Absence to earn a degree in French, I’ve resigned my position as a teacher and am now an assistant guide in Europe. I’m so grateful to have the opportunity to do work in another field about which I’m passionate, but it’s still a big change for me. I’m constantly trying to find my personal balance about the choices I’ve made and the path I’m now on. Travel is an experiment in discovery — of other cultures, histories, art, cuisine, politics, or whatever interests you; but it is also a means of self-discovery. I don’t know if I’ve found my niche, but that’s part of the personal exploration. And to me, this blog will be a work in progress, just like the human experience. We become more, reach farther, and expand ourselves because of the risks we choose to take and what we are willing to learn from our experiences. And maybe that’s why I love travel so much – it challenges me to move beyond my own parameters, to learn from others, to challenge my own preconceived ideas, and to incorporate what I’ve learned into my own life. I hope you’ll follow me as my world travels and personal journeys continue. This is not only reading, this is experiencing what you write!!!! Thank you so much!!!!!! It’s me who thanks you for reading along, Mom. Your life in unfolding before you, like the chapters in a fascinating book. Keep living and writing. It makes for great reading. I love that you are always so encouraging, Sandy. It means so much to me. Take care! Buddy, I learned a lot from that trip, too. I’m so glad we were all in it together. Thanks, Jerry, and I hope to see you in the fall. Thank you for saying that, Odile. I’m really happy that you’re enjoying it. Much love to Mo, Amari, Isla, and of course, to you. I thought I’d put your blog in my reader, but missed it somehow. So now I’m catching up – what an awesome ‘journal’ of your experiences and this transition time!